Radon is an odorless, colorless, tasteless gas that is responsible for over 22,000 deaths a year. Radon Induced Lung Cancer is the leading cause of lung cancer amongst non-smokers. Radon is most commonly sourced from the ground, it can come from other places. Know the sources of radon so you can protect your health. 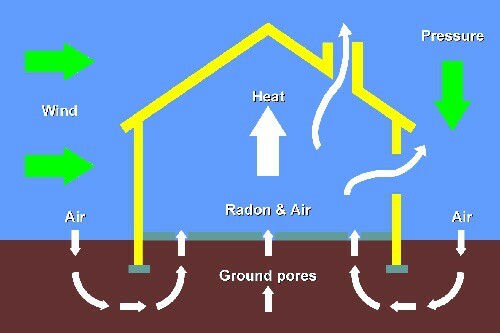 Soil- Radon is most commonly found in the soil under homes and other buildings. 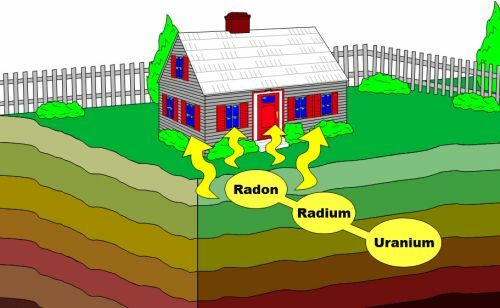 Radon comes from a breakdown of uranium a natural element found in our soil. As it decays it turns into a number of minerals but eventually turns into radon gas. Radon gas is radioactive, which means it gives off radiation. This gas becomes trapped inside of buildings and attaches itself to oxygen atoms. When we breathe in this combination the radon damages our lungs which can eventually lead to lung cancer. Do you know what concrete is made of? Concrete is made of water, rock, sand and portland cement which is a combination of limestone, shells, chalk Shale, clay and iron ore. If you notice most of the materials used come from the ground. Furthermore, most of the materials have a potential of having uranium contained within them. When this happens in a commercial building or multifamily building using large amounts of this material you can get what ifs referred to as building emanation radon. This is where the source of the radon comes from the building materials themselves instead of the ground soil. When this occurs you will have high radon levels on all or most floors of the building regardless of how high off the ground they are. Once determined as a building emanation problem, a different type of mitigation system can be installed to treat this source. Radon can also find itself trapped in natural materials we use as building materials. Granite, Slate, Marble, and Shale can all produce radon emissions. This is because most of these natural materials start off below ground. As they are forming they can bond with or form around uranium deposits. This causes a problem when these materials are excavated and used in someone’s home or office. The radiation that can emit from these materials can be harmful and more damaging than soil exposure because these items are more than likely placed in areas that people spend a large amount of time. Believe it or not, radon can be in the water. If you have a well or natural water source, radon could be part of your drinking water. Any water that passes over a granite, granitic sand or gravel has the potential for radon to be dissolved in it. Activities like showering, washing dishes, and laundering can disturb the water and release radon gas into the air you breathe. To remove radon from the water a professional radon contractor can install an aeration treatment system which mixes the water with air and vents the air before use. The other option is to install a GAC system that can filter the radon through a series of carbon filters before it reaches the source. Find Out About A Water Test Kit – Contact Us Today! Jessica Karns joined A-Z Radon Services in 2011 as the Sales & Marketing Manager. A seasoned professional, she has acquired over 10 years of experience in the sales and marketing arena. In her current position, Jessica is responsible for designing and overseeing the strategic direction of the companies’ marketing plan including web site design, social media content and media relations. In addition, Jessica is a state licensed radon testing professional. Jessica also holds a radon testing certification through the NRPP (National Radon Proficiency Program.). She heads up the companies’ continuing education program for real estate professionals. As a state certified CEU instructor, she conducts ongoing training for real estate professionals about radon. Jessica is a graduate of Kent State University in Kent Ohio. She sits on the Ohio Association of Radon Professionals Board of Directors where she continues to strengthen the industry standards by creating public policy and raising awareness for this critical issue.